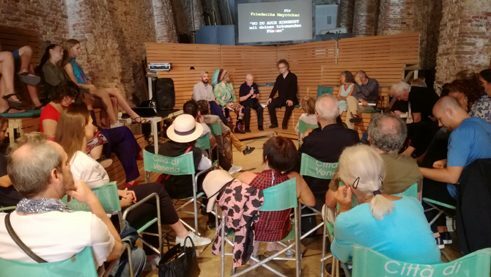 As part of the Venice Film Festival, the Goethe-Institut Milan held a reading with the filmmaker and writer Alexander Kluge. He was accompanied by director Florian Henckel von Donnersmarck, whose new film Never Look Away is not only entering the Oscar race for Germany, but was also a template for an installation by Kluge. “It’s called ‘Mostra d’Arte Cinematografica,’” says Alexander Kluge. “Happy Lamento, the film I showed at the festival, was for the ‘cinema,’ this is about the art now.” By “this,” Kluge means a hall in the Magazzini del Sale, the former salt chambers of Venice, where four televisions were set up. Each one is showing an installation in Kluge’s collage style: polychrome, sometimes mad, unusually arranged phrases alternate with photographs and interview sequences. One of the installations deals with an aspect of Florian Henckel von Donnersmarck’s new film Never Look Away, which will premiere the following day at the film festival. The director himself is expected for a short talk with Kluge. The hall is high, windowless and cool, remains of the salt that was stored here since the fifteenth century is still hanging in the air and on the walls. Many of the salt chambers had stood empty since the beginning of the twentieth century. “We broke the lock in 2007 because nobody used the rooms,” says Marco Baravalle, a member of the Sale Docks artists’ collective. At the time, people were searching for spaces in which artists could be creative outside the established institutions in the city. They found them in the salt chambers; after negotiations with the city they also got an official lease. “We have flat hierarchies here, and every week there is an open assembly where we vote on how the room will be used,” says Baravalle. The conversation with Donnersmarck is followed by a reading from The Snows of Venice, a book for which the New York-based writer Ben Lerner wrote thirteen sonnets about the destruction of Halberstadt, Kluge’s birthplace. 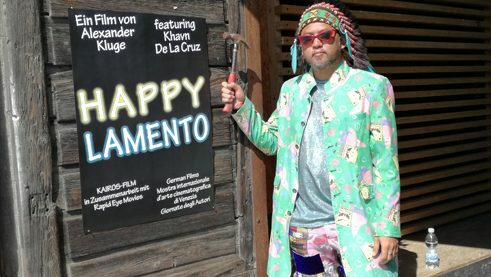 Kluge invited the Philippine avant-garde director Khavn De La Cruz for the reading, whose film Alipato he used as a set piece for his own biennial film Happy Lamento. Khavn is wearing purple velvet trousers, a coat with a SpongeBob print and a Native American feather headdress. While Kluge reads from The Snows of Venice, Khavn De La Cruz gurgles, scratches and grumbles into the microphone in a sonorous voice. This won’t, he reveals when asked, be his last collaboration with Kluge.